Chronic diseases like: Essential Hypertension, Diabetes Mellitus, Cardiovascular disease, Cancer, Obesity and metabolic syndromes. How do we have an idea about our antioxidants levels? We have a new technology device to check antioxidants levels which is very accurate determining the level of antioxidants circulating in our body in 90 seconds. How do we increase our antioxidants levels? Life pack nano is a systems of vitamins and trace elements with nano technology absorption, means 100% of vitamins that we take, 100% absorbed, the cell can work properly and we can reduce in this way the amount of free radicals from our body. Life style modification is a long process and take long time and sacrifice to reach this goal. Healthy diet which include vegetables, fruits and lean proteins every 3 hours is a goal that is really hard to reach, but when we get there we would notice the different. Healthy Muscle, Bones, Joints and Ligaments. We come into this world with healthy cells, but every day the negative effects of free radicals add to the damage of the previous day. In fact, many of the processes we call “aging” are simply evidence of the minute, cumulative effects of free radical damage on cells and tissues in the skin, heart, blood vessels, brain, and so forth. What are free radicals and, more importantly, how can free radical damage be prevented? The answer lies with antioxidants, the molecules that fight free radicals. Free radicals are highly reactive, unstable molecules that cause damage to healthy cells, leading to internal aging as well as visible signs of external aging. Each day, our young, healthy skin is exposed to trillions of free radicals; they are created inside our bodies through normal, necessary chemical reactions and all around us through pollution, UV radiation, x-rays, stress, strenuous exercise, and smoking. Smoking in particular can be harmful: each cigarette releases ten quadrillion free radicals into the lungs. This is why smokers age so much faster than nonsmokers. Overexposure to free radicals damages not only our cells’ ability to function, but also the integrity of our cells’ overall composition, resulting in a next generation of cells that is less healthy and less productive than the cells they came from. In the case of our skin, cells exposure to free radicals can mean that over time our fibroblasts—the cells responsible for collagen and elastin production—work less efficiently to produce the skin protein necessary for skin smoothness, firmness, and elasticity. Although this decrease in collagen and elastin production happens gradually beneath the outermost surface of our skin, it becomes visible sometime in our late 20s or early 30s when we look in the mirror and discover our first wrinkle. 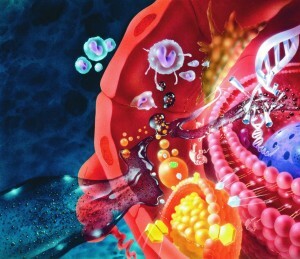 Free radicals damage lipids, proteins, and DNA (DNA is present in the nucleus of almost every cell, stores all genetic information, and dictates cellular functions). This damage is the root cause of aging. Every day, the DNA in a single cell receives thousands of free radical assaults. While our cells have repair enzymes that fix most of this damage, unfortunately, as we get older, the delicate balance between damage and repair becomes uneven. When cells with damaged DNA replicate, they create cells with imperfect structure and a compromised ability to function. In addition to the molecular DNA damage that free radicals create, they also cause damage to other basic cellular structures such as mitochondria, the structures inside the cell responsible for cellular energy production. Think of the cell as a small factory. In this factory, thousands of mitochondria act like tiny power generators that enable the cell to function properly. When scientists talk about the effect of free radicals on cellular components, such as DNA or mitochondria, they say the structure has been “oxidized.” When free radicals oxidatively damage cell structures, the health of the entire cell is weakened. For more information on how free radicals work, see Technical Appendix A at the end of this article. Despite the seemingly overwhelming assault of free radicals on our healthy cells, there is a line of defense. Antioxidants are a category of nutrients that have the ability to defend our cells by fighting cell-damaging free radicals. Since free radicals are created both in the environment and in our bodies, a continuous supply of antioxidants is critical for internal and external health and longevity. By defending our cells against free radicals, antioxidants can help slow the internal and external aging processes. Just as health and nutrition experts recommend a high intake of antioxidants from a variety of fruits and vegetables and nutritional supplements, skin care experts are now recognizing the anti-aging benefits of topically applied antioxidants. Some skin care products offer antioxidant benefits directly to the skin by including antioxidant-rich vitamins and extracts in their formulations. There are hundreds of known antioxidants, many of which are plant derived. In order to protect their constantly exposed tissues from free radicals, plants have developed free radical fighting phytochemicals as a natural defense system. Every plant contains hundreds of phytochemicals, many of which provide antioxidant protection and fulfill many other essential functions. Antioxidants work together to fight free radicals directly or to regenerate and support other antioxidants; in other words, antioxidants rely on a network for protection and support. In the antioxidant network, carotenoids are the first line of defense. By destroying free radicals, carotenoids protect and enable other antioxidants to perform their more specific and critical functions. The patented the world’s first immediate, noninvasive method of measuring overall carotenoid antioxidant activity. The incredible Pharmanex BioPhotonic Scanner has transformed the way we look at our health, and has created a business opportunity like no other in the world.